Prosciutto crudo has an ancient history. The ancient Celts in Friuli knew how to conserve meat by salting and drying it for consumption during their movements. But only at San Daniele del Friuli were conditions ideal for making such a special air-dried ham thanks to a combination of topoclimate and human skills. It was here that our grandfather Giovanni began to make his prosciutto – Prosciutto Prolongo – an art that passed to his children, to us, his grandchildren, and now to a third generation. Despite the passage of the years, the procedures are still carried out by hand. Most Prolongo prosciuttos are made in harmony with the natural passage of the seasons, just as they were in past. We concentrate the arrival of fresh pig thighs in the “vernengo” (winter) period from October to February and stay faithful to the same tradition that Grandfather Giovanni taught us with such passion. Raw materials are the foundation for any product of excellence, as we well know. That’s why we work with the finest suppliers to secure top-quality meat. By law, the fresh thighs can only come from pigs born, bred and butchered in Italy that have been monitored from birth and fed to ensure their wellbeing. Traceability is always guaranteed thanks to the codes incorporated into fire brands and tattoos. But there is more. When the fresh thighs are delivered, they are carefully selected. Any that present the slightest defect are discarded, without exception. Only the finest raw material can go on to become a Prosciutto Prolongo. Prosciutto di San Daniele is a completely natural product, salted using only coarse sea salt with no additives or preservatives. First of all, the fresh thighs are massaged individually by hand. Next, in compliance with the time-honoured golden rule, we cover them with salt and leave them for the same number of days as the kilograms in their weight. After this, the hams are pressed, an operation that is characteristic of San Daniele and gives Prosciutto di San Daniele its traditional guitar shape. Even though most pressing is mechanised nowadays, we have resisted the temptation to use machinery. At the Prosciuttificio Prolongo, the pig thighs are still hand-pressed by laying them horizontally one on top of another, separated by boards, to obtain a slower, more natural and more delicate pressure. 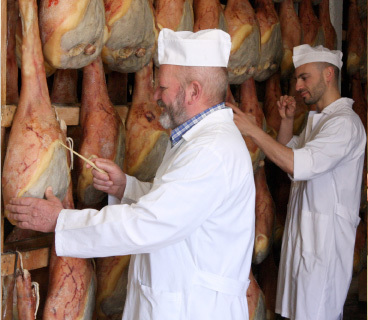 The core of ham making at Prosciuttificio Prolongo is natural maturation. The hams hang for many months on wooden shelves in a large, unconditioned room fitted only with a large number of unpaned windows. Time passes slowly, marked by the changing climate conditions outside. Every day, the window shutters are raised and lowered one by one, depending on the day’s weather. This procedure enables us to get the most from the local topoclimate and the two winds from sea and mountains that caress the hill of San Daniele del Friuli. Our hams dry naturally to become perfect Prosciutto di San Daniele. 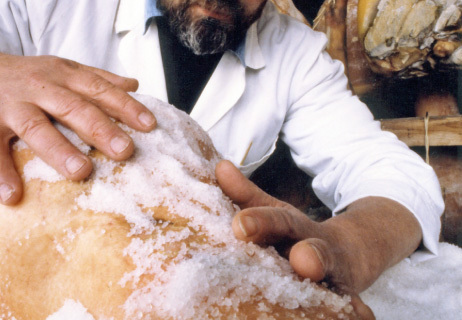 The next operation is “stuccatura”, a crucial operation in which parts of the thigh not covered by rind are protected with a natural mixture of leaf lard, salt, pepper and flour. The procedure also serves to soften the exposed areas, allowing the meat to breathe. Stuccatura is a delicate operation requiring care and skill and it can only be done by hand, inspecting the thighs one by one. For the final months of maturation, the hams are moved to the cellar, which has constant temperature and humidity, and very few windows. It is this change of environmental conditions that will bring out all the aromas of a well-matured product. A wide range of almost-daily checks on progress are carried out at all stages of production. We assess the condition of the ham’s rind, shape and colour using our sense of sight. We check the firmness of the flesh by touch, feeling each ham with our hands. Hearing enables us to monitor the sound of the product when we strike the rind to check the ham’s texture and fullness. But it is our sense of smell that is used for the crucial test. “Puntatura” is the insertion of a slender horse bone needle into the ham. Horse bone absorbs the aromas inside the ham and releases them under the nostrils of the master prosciutto maker. Only after all these checks have been completed, and after more than a year’s maturation, do the hams become fire-branded, protected designation of origin Prosciutto di San Daniele D.O.P. Branding marks the end of the long ham-making process and guarantees that your Prosciutto di San Daniele is of the highest quality. At the end of all this tender loving care, our delicious, naturally matured Prosciutto Prolongo is at last ready to be savoured. We bring you the bounty of our prosciutto, made by craft workers since 1957. Now it’s your turn. Taste Prolongo Prosciutto!